It’s been two years since the launch of Product Hunt as a listicle for discovering tech products. Today the site gets a brand new design to reflect the addition of games, podcasts, books, collections and live categories since that time. Product Hunt added the games category earlier this year and has since expanded to up-voted lists for books, podcasts and the live section – a part of the site where well-known figures can hold AMA’s with the Product Hunt community. The old homepage only showcased technology products. But now a site visitor might be really into technology products, another person into books – or maybe they are into both. Founder Ryan Hoover is looking ahead at what the site will be as it continues to grow. A few months ago, Hoover hinted a redesign was coming, teasing out an early mockup for the site on a Medium post in early September. “I honestly debated whether we should share this now,” Hoover wrote at the time. But it makes sense for Hoover to involve his base in the new site design. Product Hunt is a place made up of product enthusiasts sharing what’s cool and offering their thoughts on those finds. More than 2,000 people joined the “Product Hunt Friends” Slack group to offer their thoughts on the new layout before the official launch. It’s also smart. Hoover believes the feedback saved his startup some money. “Sharing early designs on InVision and “building in public” has helped us refine our design before putting it into code (which is much more costly and harder to change than pixels),” Hoover wrote in a post explaining the new design. 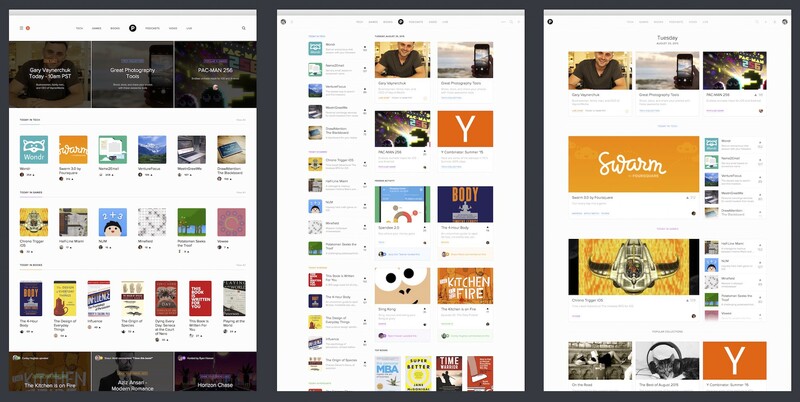 The three redesign options Product Hunt presented to the community on September 1, 2015. There’s still no word on how Product Hunt plans to monetize. Hoover said he had some ideas for that, but the focus was on adding categories and growth, especially beyond tech, for now. “I’d rather dedicate all of that energy into growing the community before moving onto monetization,” Hoover said. The founder didn’t want to disclose any growth figures at this time and it’s not clear what he plans to add to the platform next. The Product Hunt homepage will carry just the five categories for now, but Hoover did rattle off a few possible additions, including fashion and beauty products, as well as a section devoted to sneakerheads. For those unfamiliar, a sneakerhead is a person who collects “limited, rare, OG, or flat out exclusive kicks,” according to Urban Dictionary. See our editor in chief (aka my boss) Matthew Panzarino’s feet next time you see him for further reference. Hoover thinks there will probably be a few people upset at the new look, even after polling the community. “Inevitably there will be some people who see the new design and say ‘oh I like the old page. I don’t like this new thing’,” Hoover said. Those who don’t like the new site design can go to producthunt.com/tech to see Product Hunt the way it was before.